Pirarubicin is an anthracycline drug. An analogue of the anthracycline antineoplastic antibiotic doxorubicin. Pirarubicin intercalates into DNA and interacts with topoisomerase II, thereby inhibiting DNA replication and repair and RNA and protein synthesis. 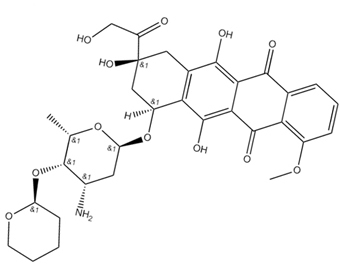 This agent is less cardiotoxic than doxorubicin and exhibits activity against some doxorubicin-resistant cell lines.
. Takigawa N, et al. Cytotoxic effect of topoisomerase II inhibitors against adriamycin- and etoposide-resistant small cell lung cancer sublines. Gan To Kagaku Ryoho. 1993 May;20(7):929-35.
. Nagai K, et al. Relationships between the in vitro cytotoxicity and transport characteristics of pirarubicin and doxorubicin in M5076 ovarian sarcoma cells, and comparison with those in Ehrlich ascites carcinoma cells. Cancer Chemother Pharmacol. 2002 Mar;49(3):244-50. Epub 2002 Jan 8.